* Fils de Dieu goes on like a cocktail (possible a mojito) with citrus, coconut, ginger, and green notes blending together. * As it develops, it smells even more like a mojito with lime and vanilla joining in as the coconut note increases in intensity. * This wears differently on me sometimes. It’s gone in a floral direction a few times with rose and jasmine coming up. Other times the mojito gets dosed with a foody notes of cinnamon, cardamom, and rice. * The mojito drifts away as vanilla and amber form the base with a soft leather and musk chiming in. Summary: When I was in Paris last year at Eldo boutique in the Marais, I got to sniff this and it was referred to as Filipino Houseboy. I am guessing they renamed it because they were afraid that it might be considered offensive. Seeing as this is the same brand that released Secretions Magnifiques, arguably the most offensive fragrance ever made, I am unclear as to why they changed the name. I love this scent and plan to buy a bottle as it is light enough for summer wear as an Eau du cologne but has enough weight to stick around. Fils de Dieu could be considered office-friendly in light doses. If you spray on too much, it does start to project loudly. Longevity is strong, more than 8 hours. 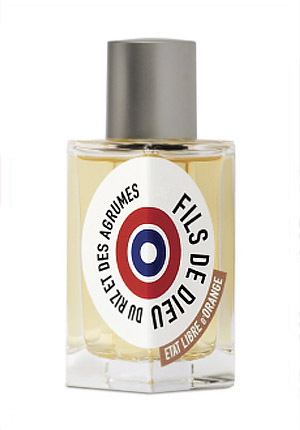 Fils de Dieu is available at Lucky Scent , Min New York , Henri Bendel and other select boutiques. This one is on my to-try list. It’s a great one. I was impressed by the longevity of it. I found out that if you go to the Paris boutique, they actually have a limited edition of bottles labeled as Philipino Houseboy. Well, you know how I felt about the old name. Now the new name is too long to say. Tried this at Scent Bar this week. I want a bottle badly. I am totally with you. I found someone in Paris who is going to buy me a bottle of Philipino Houseboy.. because that so fits with me decor… don’t you think? At least I can remember the name PH. I can’t remember what it is called here.